Who is Ryan Hawke – Ethan Hawke’s Wife, How Did They Meet? Home Actors & Actresses Who is Ryan Hawke – Ethan Hawke’s Wife, How Did They Meet? One of the intriguing things to look forward to in every red carpet event that involves star actors and actresses is basically Hollywood couples. They often times make the heart melt with their PDAs and their outfits. Yes! without doubts, there is nothing more joyous than having a partner who practically rides on the same boat with you. Ryan Hawke and Ethan Hawke is one power couple that’s got everyone talking – their PDA at the 2019 Oscar award event was the talk of the town. 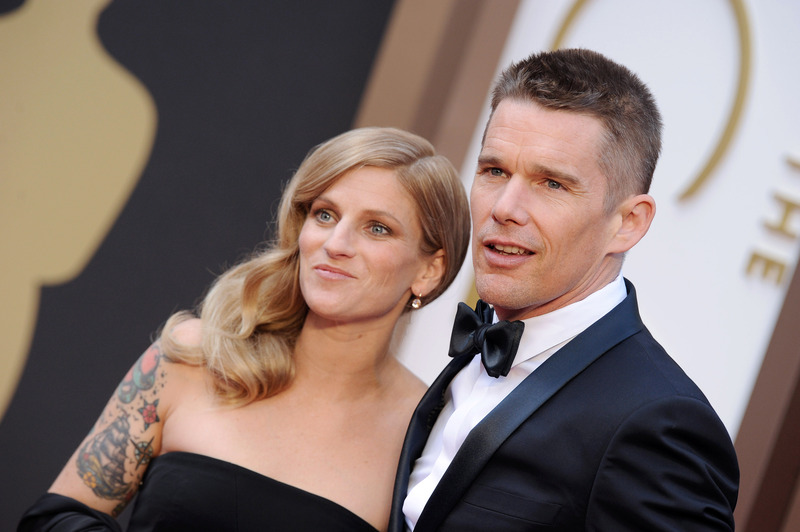 In addition to spilling all the juicy details on their love life, we delve more into the life of the woman who is beside Ethan Hawke in all of his endeavors. Irrespective of the fact that Ryan Hawke has managed to build a career as an actress and producer, she gained fame with her union with the star actor Ethan Hawke. Ryan Hawke was born as Ryan Shawhughes. She had her formative years in the United States of America where she was born and schooled at the Columbia University. Unfortunately, her exact birthdate isn’t known to the public. Ryan Ethan is one of the few actresses who has bagged a few roles ever since the inception of their career. She made her first acting appearance in the 2006 movie, The Hottest State. The movie was directed by her then boss turn husband Ethan Hawke. There, she played as Williamsburg girl. She subsequently worked behind the scenes as an associate producer for the thriller, First Reformed in 2017. Then in 2018, she produced the movie, Blaze. Ryan Hawke’s and Ethan Hawke marriage became the confirmations of rumors that was caused by model Uma Thurman, Ethan’s ex-wife. As interesting as that may sound, the story just began. Ryan Hawke initially met Ethan for the first time, during her days as a college student. As at that time, Ethan was still married to his ex-wife, one thing led to another, Ryan started to work as his children’s nanny. Ryan’s continuous stay in the house ignited a love tango between herself and the actor, thus she became his mistress. From then on, things went downward spiral for Ethan’s union with his wife Umar. Unfortunately, a couple once regarded as power couples were headed for the rocks and Umar made sure of it by spilling details of her husband’s infidelity. The inevitable happened in 2003 when they separated as man and wife and by 2005 finalized their divorce. Right after their split, the media went for Ryan as she was seen as the primary cause of Ethan’s split, thus she was labeled a home-wrecker. However, Ethan objected to these claims, publicly stating that his former marriage fell because of other pressures. He later went ahead to make a vague statement pertaining his extramarital affairs saying that sexual infidelity was not an important aspect of his break up. With a statement like this, there are claims insinuating that the actor was trying to justify his infidelity with his ex-wife. Shortly after his divorce, the actor took to several platforms, showcasing his relationship with Ryan Hawke. Sources say that the two started dating shortly after his separation from his ex-wife. Subsequently, in 2007, Ryan became pregnant with their first child. Then in 2008, they tied the knot in the month of June in a private yet elaborate ceremony in New York City. They also welcomed their first child and daughter, Clementine Jane Hawke that same month. Three years down the lane, they welcomed their second daughter, Indiana. For the records, Ethan has two other children named Maya and Levon from his previous marriage with Umar. See Also: Meet Jordyn Blum and Spouse – Dave Grohl, How Did They Meet? Despite the troubles that happened that period, Ryan Hawke didn’t seem to give a hoot about the rumors. She remains her husband’s backbone and has even gone ahead to tattoo his initials on her arm. She also is ever present, walking arm in arm with him in every red carpet event. Together, the family resides in Boerum Hill, New York City and also own a townhouse, in Manhattan, New York City, as well as an island in Nova Scotia, Canada.